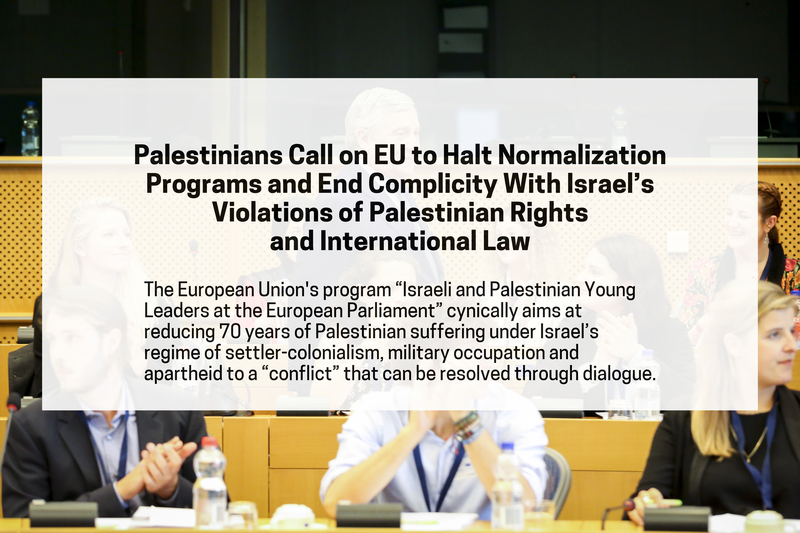 During a time in which Israel is adopting the racist “Jewish nation-state” law, which turns apartheid's policy into a constitutional law, and while it continues its crimes against peaceful Palestinian demonstrators in the Gaza Strip for the right of return and ending the siege, the EU must stop its disgraceful complicity with these crimes instead of financing projects aimed at covering the face of this colonial and racist system. European banks continue their trade relations with Israeli banks, despite the central role played by the latter in financing, providing services, or supporting illegal settlements established by Israel in occupied Palestinian territory (or Syria). A recent report by “Human Rights Watch” concluded that "companies can not fulfill their human rights responsibilities if they continue to carry out activities inside or for the [Israeli] settlements."